This Spider-Man party cake recipe post contains affiliate links. We only recommend products that we love! For our Spider-Man Party Cake, we wanted to include details of other super heroes as well! This super hero cake is fairly simple to create and is the perfect addition to your Spider-Man Party! It’s also a great Father’s Day cake recipe, as every dad is a Super Hero in their child’s eyes! berry flavored applesauce – you’ll substitute the oil that is called for with the berry applesauce. Check out our strawberry applesauce recipe if you’d like to make your own. Mix together wet ingredients according to cake mix instructions, substituting the berry flavored applesauce for the oil that is called for. Add 2 tablespoons of strawberry extract to the mix. Add several drops of red food coloring to the wet ingredients to create a red batter. Gradually add in the dry cake mix and stir until well blended. Spray 8″ round pans and 8″ square pans with non stick baking spray and pour batter evenly into the 4 pans. Bake in preheated oven for 30-33 minutes or until toothpick inserted in middle comes out clean. Allow cakes to cool in pans for 15 minutes and remove. Make sure cakes have cooled completely before decorating. By replacing the oil with the berry flavored applesauce, this Spider-Man party cake recipe becomes a much healthier dessert option than the standard boxed cake! To decorate the Spider-Man Party Cake recipe you’ll need the following. Begin by covering your cake base or place with a fairly thick layer of red fondant. Roll the fondant into a large enough piece to cover the base and carefully trim access away with a knife. Stack and cover the 8″ round cakes with the prepared white buttercream. This is only a base for the fondant so it does not need to be pretty! Roll out enough prepared yellow fondant to cover the 8″ round layer. Place the fondant over the buttercream covered cake and carefully smooth with the fondant smoothing tool, making sure to remove all air bubbles. Trim the access fondant off. Stack the two 8″ square cakes and trim 3 of the 4 corners off to create the shape of the Superman emblem (use your template). Cover the now Superman emblem shaped cake with prepared white buttercream. Roll out enough prepared blue fondant to cover this layer. Place the fondant over the buttercream covered cake and carefully smooth and remove air bubbles. Trim access fondant from the bottom. Add a small amount of frosting to the center of your yellow round cake. Carefully lift the Superman emblem layer and place on top of the yellow round cake. Roll a small amount of prepared yellow fondant and cut it to the size and shape of the Superman emblem layer. Add it to the top of the cake. Roll out a small amount of prepared red fondant and use your Superman emblem template to cut a replica from the fondant. Add this on top of the yellow fondant. Using the yellow and blue buttercream and piping bags, edge each cake as shown in our photo. 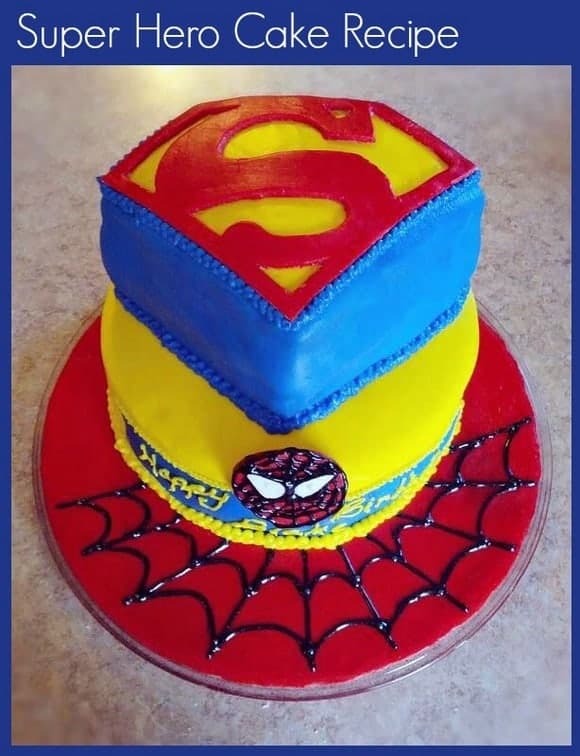 Use a small piece of red fondant to create a Spider-Man face and attach it to the front of the yellow cake. Use the black sparkle gel and white to detail his mask. Use the black sparkle gel to draw a web onto the fondant covered cake base. If your cake is for a child’s birthday, you can add a Happy Birthday message below Spider-Man’s face! Not only does this Spider-Man Party Cake Recipe look great from the outside, it tastes great and the red cake inside will be a great surprise for everyone! 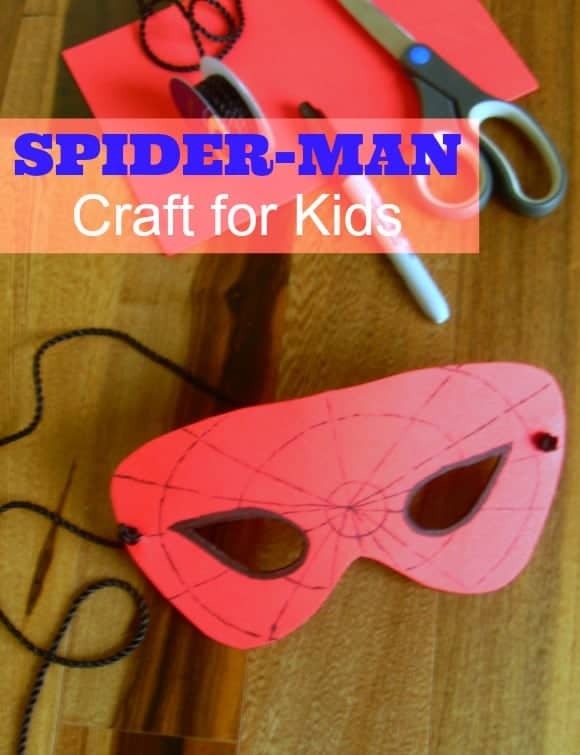 A party means crafts and games for kids, check this lovely Spider-Man Mask craft for kids and those Spider-Man Party games for kids. Do your kids love super heroes? Which one would they love to see turned into a cake? What Do Your Kids Really Want from Summer Vacations? Racquel is a stay at home mom with an extensive background in interior home design. She loves baking & creating beautifully decorated treats, cooking new and unique recipes for the whole family, designing and decorating on a budget with upcycled projects, and making kid and grown-up crafts. Oh now that is cute! And it looks simple enough that even I could make it! This is one heck of a gorgeous Spider Man Cake! Any kid in the world would love to have this for their birthday! My almost 2 year old grandson is enthralled with Superman, what a great cake to make for his upcoming birthday! My almost 2 year old grandson loves Spiderman, I think I just may make him this cake for his birhday!! What a neat cake, little boys would love this, and husbands too! so awesome, my kids love spiderman! You make it sound so easy. I would love to do this instead of spending all the money on one to have it made. I will have to practice and try this myself my son loves superheros. What a great looking birthday cake and I know my grandson would love this cake as he is all about super heroes right now. My son loves Spider-Man and this would be perfect for his birthday in February. Wish me luck because I am bookmarking this and am going to attempt to make it then. What a cute idea! My daughter absolutely loves Spider-Man. OMG that is awesome can you please come to my house and make my sons birthday cake. I can never get things like this right. Wow that is an awesome cake. My nephew would love that! This is awesome! Pinned it and will be making it in August for my son’s 2nd bday thank you! Very cool birthday cake for a child’s birthday party. I know that all the kids attending will love sinking their teeth into it. The cake looks so good and bet it taste good too. Love the mask idea also. Thanks for sharing. Wow that cake looks awesome, can’t even tell it’s DIY and the makes are so fun too. What a neat cake! Kids who love Spider Man would really love a cake like that for a party! This nice. I am not talented myself to make such a cake. But I definitely love the craft! That is so cool, thank you for sharing this cake with us! Very cool, I wish that I had the skills to make my own cakes. My youngest is wanting a “Frozen” theme. Since he is a boy, I was wanting more than just the princesses on his cake. He is in love with Frozen.